Mother Nature does have a sense of humor. On a recent business trip to Puerto Rico, I was walking to the beach early one morning on a narrow paved road surrounded by dense forest and tall, viney trees. The humidity was stifling and I was in a bit of a funk, I just wanted to be home with my family. At the next turn, my heart leapt into my throat when I almost ran straight into a giant iguana. The beast must have been 8 feet long, lying in the middle of the road, motionless. It took me a moment to realize that it was dead, but that didn’t make me feel any more comfortable. 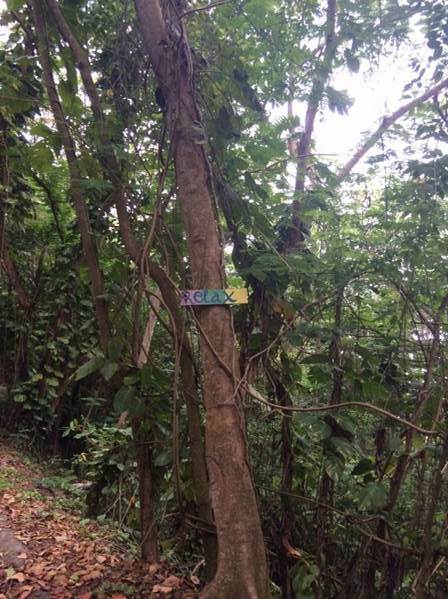 I was starting to wonder why I had thought a morning walk alone in the wilds of Puerto Rico was a good idea. I asked Mother Nature to send me a sign, what was I doing here? What was I supposed to do? And then my eyes landed upon, yes an actual sign. Mother Nature does have a sense of humor, you know. The sign said “Relax”. I laughed to myself and knew that was the key. I just had to relax. It’s amazing what can happen when you take a deep breath and let yourself fall into nature’s open arms. Next time you are having trouble making forward movement, take a step back and relax…you might be surprised what happens next!